The Enterprise encounters a rogue comet in Masks. Sailing through space for millions of years, the Enterprise studies the comet, but it sends out its own probe, and this starts to manifest itself on the ship. The crew soon learns that there’s a structure at the heart of the comet, and weird artifacts start to appear all over the Enterprise. Data tries to communicate with the entity, but different beings take over his mind and body, and he displays multiple personalities. Slowly, something starts to transform the physical structure of the ship as well. A fairly silly episode, “Masks” starts slowly and never really goes anywhere. Right after “Self”, it seems a little soon to see Data act unlike his normal self, and his multiple personalities feel like little more than an excuse for Brent Spiner to flex his acting muscles. Add to that a really goofy pay-off for the story and “Masks” seems like a lesser program of Trek. At the start of Eye of the Beholder, Lt. Dan Kwan (Tim Lounibos) kills himself as he jumps into a warp nacelle. Troi and Worf investigate why the apparently happy and well-adjusted Kwan would commit suicide, and the mystery intensifies when Troi encounters strange emotions around the place where Kwan died. When she tries to recreate this experience, she finds herself oddly transported back to the time and place of the Enterprise’s creation. The rest of the episode follows additional explorations of reality and the empathic echoes sensed by Troi. Though it tips its hand too early, “Beholder” offers a fairly intriguing mystery. The show makes some of its divergences from reality a little too clear, but it still manages to keep us off-guard for the most part, and the plot provides a pretty lively experience. “Beholder” doesn’t offer excellent Trek, but it still works well. During some field tests of new tactical systems and weapons upgrades, some of the crewmembers start to experience unusual physical issues. In Genesis, Worf becomes exceedingly irritable and acts primitively, while Troi feels cold and dry. Lt. Barclay (Dwight Schulz) gets hyper, La Forge is tired, and Riker turns forgetful. This spreads to all the crewmembers, which means Picard and Data must fix things when they return. “Genesis” rebounds from a string of fairly lackluster episodes with a lively one. Like “Beholder”, it manages a stimulating mystery, but it doesn’t give us as many unnecessary clues. The odd behavior of the crewmembers also adds some interesting components. “Genesis” seems vivid and enjoyable. When the Federation finalizes a treaty with the Cardassians, this creates a demilitarized zone. Unfortunately, some Federation colonies sit in disputed territory, so Journey’s End finds the Enterprise charged with the movement of an American Indian colony on Dorvan V. Though they only settled there 20 years earlier, it took them 200 years to find the spot, so they display great reluctance to leave. In addition, Cadet Wesley Crusher returns to the Enterprise for a vacation, but he displays an unusually surly attitude toward his mother and his friends. In an odd twist, an Indian named Lakanta (Ned Romero) claims that he saw Wesley in a vision, and he states that he can provide Wesley with some answers. Political correctness alert! “End” displays those sentiments in spades, and those overtones make the program something of a drag at times. The return of Wesley doesn’t help, as his presence distracts from the rest of the show; the sight of the much-disliked Crusher on an Indian vision quest becomes awfully silly. “End” earns some points as it attempts something a little different at times, but the whole seems a bit slow and excessively earnest. Once again we explore the family life of Worf in Firstborn. His son Alexander (Brian Bonsall) rejects the path of the Klingon Rites of Ascension, so Picard arranges for him to learn more about the culture. The ship heads to an outpost where they can attend a Klingon festival. There Worf learns of a plot to kill him, but his brother Kurn’s adviser K’mtar (James Sloyan) intervenes and prevents this. The crew investigates the folks behind the attack while Alexander gets more involved with his heritage. Trek writers seem fascinated with Klingon culture, but frankly, I got fairly tired of that stuff a few seasons ago. Alexander always annoyed me as well. He’s kind of a Klingon Wesley, so I don’t much like episodes in which he prominently features. The exploration of the murder plot offers some interesting parts, but otherwise “Firstborn” comes across as pretty lackluster, and its Scooby-Doo ending doesn’t help. Another familial twist occurs in Bloodlines. At the start, an unmanned probe hails the Enterprise. A hologram of a Ferengi named Bok (Lee Arenberg) declares that he’ll get revenge on Picard for the murder of his son; to that end, Box claims that he’ll kill Jason Vigo (Ken Olandt), Picard’s son. Picard got it on with Miranda Vigo decades back, so the possibility exists that Jason’s Jean-Luc’s son. The Enterprise locates Jason and conducts tests to determine Picard’s paternity, and these come back positive. While the Enterprise attempts to find Bok and foil his plans, Picard and Jason awkwardly get to know each other. Inevitably, some surprises occur along the way. Another day, another fairly gimmicky episode. More than 170 shows into the series, it seems a little late for Picard to discover a son. The program proceeds on a pretty predictable path, as those surprises don’t seem very surprising. “Bloodlines” doesn’t really offer anything distinctly clever or intriguing. We find mysterious ship behavior in Emergence. First Data and Picard encounter a weird convergence of programs in the holodeck, and then the ship apparently acts on its own to avoid destruction. When the crew investigates, they discover multiple programs running simultaneous on the holodeck. It appears that the ship has started to develop its own form of intelligence and awareness, and these focus on the holodeck. The crew tries to deal with this mystery via interactions with holodeck-created characters. As I’ve noted in the past, I don’t usually care for episodes that revolve around the holodeck. While “Emergence” doesn’t deal with the usual silly fake adventure, its reliance on those elements to some degree make it less interesting. In addition, “Emergence” reminds me a lot of Season Six’s “The Quality of Life”, in which some little robot critters developed their own intelligence. As such, “Emergence” seems somewhat flat and unengaging. Frankly, it feels like little more than another excuse to feature some of the wacky holodeck shenanigans and characters. Preemptive Strike sends the Enterprise toward the demilitarized zone between the Federation and the Cardassians. The Maquis, a member of the Federation, attacks a Cardassian ship, and the Enterprise comes to the aid of the Cardassians. It looks like the Maquis have started to plan for an aggressive attack on the Cardassians, so Starfleet needs more information. Picard selects newly returned Lt. Ro Laren (Michelle Forbes) to infiltrate the Maquis ranks and find out more about these concerns. Although I felt surprised that the penultimate Next Generation episode focused on a minor character like Ro, “Strike” offered a pretty engaging show. Some parts of it felt predictable, but the program managed a nice layer of depth that made it compelling. It managed to avoid easy answers and seemed provocative. With All Good Things..., we find our final televised Next Generation adventure; we’d not hear from the crew of the Enterprise-D until the theatrical release of Generations about half a year after this show’s broadcast. A telefilm itself, “Things” offers a double-length episode that doesn’t split into two parts, unlike almost all of the series’ extra-long programs. In this program, Picard starts to experience some odd shifts in time. He varies between the present, 25 years into the future, and seven years into the past, back when he first gained command of the Enterprise. The episode follows his attempts to come to terms with these changes in chronology, and when Q (John de Lancie) appears, the plot thickens. In fact, it thickens enough that I won’t divulge anything else about the story; “Things” provides so many twists and surprises that I don’t want to give away its surprises. Suffice it to say that “Things” ends the series on a satisfying note. The program seems lively and clever, and it finishes the televised run of Next Generation in a fine way. Too bad all of Season Seven didn’t live up to the same standards. Don’t get me wrong – it still offered a lot of solid entertainment. However, I felt that a few too many of the episodes seemed mediocre. Season Seven avoided the clunkers that occasionally marred the show’s first couple of years, but it failed to equal the level of consistency seem during the series’ better runs. Still, average Trek remains better than most other shows, so I think Season Seven finishes Next Generation in a reasonably positive manner. Star Trek: The Next Generation appears in an aspect ratio of 1.33:1 on these single-sided, double-layered DVDs; due to those dimensions, the image has not been enhanced for 16X9 televisions. It’s déjà vu all over again, as Season Seven presented visuals virtually identical to those of the past few years. As happened with all the different seasons, sharpness varied. During most of the shots, the image remained reasonably accurate and crisp, but exceptions definitely occurred on more than a few occasions. Wider shots displayed the most notable softness, but periodic close-ups also showed some fuzziness at times. Still, the shows remained reasonably tight and distinct for the most part. I noticed the usual minor amount of jagged edges and moiré effects, and a little edge enhancement appeared as well, but these didn’t seem like significant issues. 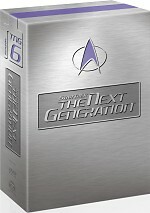 Although the first few years of Next Generation suffered from a mix of source defects, those concerns essentially disappeared during the final few seasons. Number Seven included a little grain at times and the occasional speckles, but that was about it. Otherwise, the shows looked nicely clean and fresh. Once again, colors came across as generally good but inconsistent. Sometimes I felt the hues were quite vivid and vibrant, but on other occasions, they seemed rather flat and muddy. Overall, the colors remained fairly positive, though. Not surprisingly, black levels also varied. Sometimes they looked deep and dense, but other times they were a bit murky and inky. Shadow detail usually offered good definition to low-light shots, though some were a bit too opaque. In the end, the visuals of Season Seven remained positive for the most part. While picture steadily improved over the years, Season Seven demonstrated Dolby Digital 5.1 sound that appeared similar to that heard during the first six years. I regarded that as a good thing, since those earlier episodes offered solid audio. While not anything extravagant, the shows displayed nicely involving and broad soundfields. Music showed positive stereo imaging, while effects created a good sense of environment. In the front speakers, we heard a natural and lively atmosphere, and the audio branched to the surrounds well as necessary. For the most part, the rear speakers concentrated on general reinforcement, but they came to life well when necessary and appropriate. As always, audio quality remained positive. Speech seemed distinct and natural, and I discerned no issues connected to intelligibility or edginess. The score sounded vibrant and bold, as the music appeared bright and dynamic. Effects presented solid detail and clarity, and they also offered nice low-end material at times. Ultimately, the soundtrack for Season Seven continued the tradition of high quality audio started with the first DVD set. Season Seven packs a bunch of video extras that use the same format of those on the prior six. All of these consist of moderately brief documentaries, and they reside on DVD Seven. The Mission Overview examines a few general issues. During this 14-minute and 45-second program, we get show clips, stills from the set, and a mix of new and archival interviews with actors Brent Spiner, Gates McFadden, Wil Wheaton, Jonathan Frakes, LeVar Burton and Marina Sirtis, executive producers Michael Piller, Jeri Taylor and Rick Berman, and writers Brannon Braga and Ronald D. Moore. In “Mission Overview”, we hear about the season’s emphasis on family and get a lot of information about Wesley’s finale in “Journey’s End”. We also learn about some intersections with Deep Space Nine as well as issues related to the end of the Next Generation series. Too much of the data remains rather general, but the “Overview” still includes some decent material. For something unusual, we move to A Captain’s Tribute. This 16-minute and 28-second program features interviews with no one other than actor Patrick Stewart, and it intercuts his comments with show clips. Stewart reminisces about his main costars and gives us a few thoughts about each of them. This makes the featurette rather gushy at times, as Stewart’s statements invariably tend toward the glowing side of things, but he provides some good stories, and those help make the piece entertaining. Like past entries in the series, Departmental Briefing: Production offers some nice notes on technical issues. During the 15-minute and 42-second piece, we hear from supervising producer Peter Lauritson, actors Jonathan Frakes, Gates McFadden, Patrick Stewart, and Marina Sirtis, make-up designer Michael Westmore, writer Brannon Braga, visual effects coordinator Ronald B. Moore, and scenic artist supervisor Mike Okuda. As with “Mission Overview”, the program concentrates mainly on a few different episodes. In particular, they discuss the monster make-ups and other challenges of “Genesis” plus the multiple Enterprises of “Parallels”. In addition, we get some notes about attempts to move Picard from the captain’s chair and efforts to develop stronger female characters. It moves through the programs briskly and seems generally useful. Happily, The Making of “All Good Things...” provides a lot of good material. The 17-minute and 40-second program provides remarks from executive producers Taylor, Berman and Piller, writers Braga and Moore, make-up designer Westmore, make-up artist Deborah Zoller, scenic artist supervisor Okuda, visual effects supervisor Curry, director Winrich Kolbe, director of photography Jonathan West, and actors Sirtis, Crosby, Burton and Colm Meaney. The featurette covers “Things” from the origins of its story through many aspects of the production. It offers a surprisingly rich and complete look at the show, and it gives us some solid information about its creation. Inside the DVD’s complicated foldout case, we find a small booklet with a smidgen of information. It includes a valedictory statement from executive producer Rick Berman and it also shows all 26 episodes listed in alphabetical order. As with the Season Six set, Season Seven includes a Deep Space Nine DVD Preview. However, this one features more than just a simple ad. Instead, it offers an early look at some of the DS9 supplements. We find some interviews with executive producers Berman and Ira Steven Behr plus actors Avery Brooks, Nana Visitor, Andrew J. Robinson, Michael Dorn and Terry Farrell. Though I’ve never seen DS9, this four-minute and 51-second promo helps pique my curiosity. But I won’t check out the first season of that show for another two months, which allows me some time to recuperate from the nearly 180 episodes of Star Trek: The Next Generation that I watched over the last nine months. It was a fun ride, and though Season Seven wasn’t consistently solid, it offered enough good material to make it another enjoyable experience. The DVD features picture and sound quality similar to those of the last couple seasons, and it also provides a decent roster of featurettes. Season Seven ends the series on a fairly positive note and will make a nice addition to the collections of fans.